One of the biggest problems following ICD-10 implementation will be fulfilling documentation requirements necessary to support the specificity required for ICD-10. Based on thousands of ICD-10 assessments, only 63 percent of today’s documentation is ready for the new ICD-10 diagnosis code set. It is a concern that documentation has been forgotten among the other objectives of implementation. Accurate coding and proper payment will not be possible without clinical documentation improvement. A behavioral change in documentation habits for most providers is necessary, and time is of the essence. 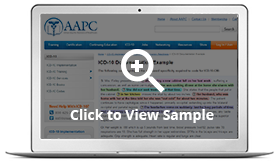 Evaluate your current documentation for ICD-10. Identify the deficiencies and education needed to improve. Avoid denied or un-billable claims and reduce the risk of interruption in revenue.